The TV series Gumrah has become a popular reality-based youth series, which is aired on Channel V. The series is now entering its third season and is expected to be hosted by Bollywood actor Ajay Devgn. So far, the show was hosted by actor Karan Kundra, who will be joined by the ‘Singham’ actor. Devgn will be featured in an episode which will be aired on August 25, 2013. Kundra said, “He (Ajay) is very down-to-earth and never makes you feel that he’s a superstar. The experience was really nice and I had an amazing time shooting with him”. For Bollywood, the TV medium has always been a major source of publicity for the upcoming movies. In recent times, it has become a trend for the stars of the upcoming movies to show up in one of the popular TV series which will help them to promote the movie to the TV audience. 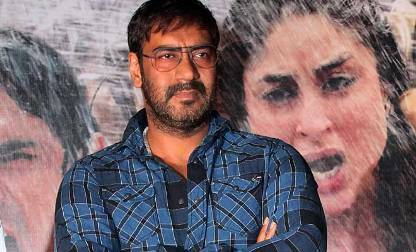 Ajay will be appearing on Gumrah 3 in order to promote his upcoming political thriller movie ‘Satyagraha’. The movie is directed by Prajash Jha and also has Kareena Kapoor as his co-star. The other actors in the movie include Amitabh Bachchan, Manoj Bajpayee, Amrita Rao and Arjun Rampal. The movie is all set to hit the theaters on August 30, 2013.